Since I had my third child last year I have noticed that if you have more then two children then holiday's can be pretty expensive and a tricky business, as hotel rooms rarely cater for families of five and the cost for the five of us going abroad will be rather expensive. So when I heard of HomeExchange I thought that this would be a great idea for someone with a larger family or for families who can not afford the sky-high fee's hotels charge during school holiday's. HomeExchange is a company that helps you arrange to home swap with another member in over 150 countries worldwide for a holiday in each other's homes. So you go and visit another country on holiday and stay at someones home rather than a costly hotel and they go and have a holiday at your home at the same time. 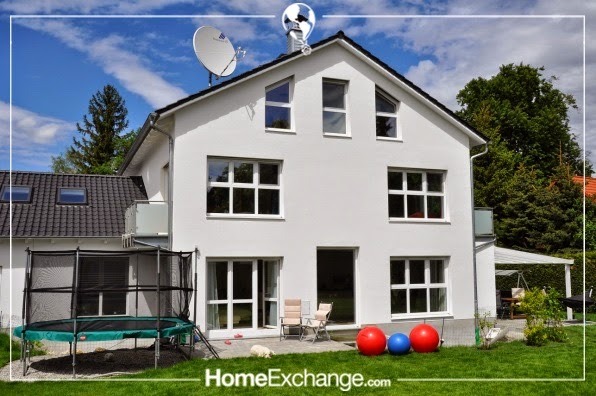 HomeExchange have twenty year's experience with 65,000 listings on their website and have helped over 1,000,000 exchanges take place. How it work's is you sign up and pay the membership fee which is £100 per year. You then add your home to the listings making sure you add photo's of your home and videos if you wish and then describe your home including any local attractions that people may be interested in, ensuring that you are honest with your review. You then search over 65,000 worldwide listings to see if there is a home in a country you would like to visit and see if they would like to swap homes with you for a holiday. This can save you a huge 58% saving on your holiday costs as once you pay the membership fee that's it there are no extra accommodation costs involved. It also means that you can experience what life is really like as a local in the country you are visiting, and there will be lots of home comforts such as a kitchen to cook in and a homely environment which you would not experience in a hotel. Once you have found someone to swap with you just need to make sure that you are both happy with the exchange and arrange dates that will suit you both. You then sign a digital exchange agreement which helps make the exchange more official and stops any confusing. One of the things that I think many people will be unsure of when swapping homes with a stranger for a holiday is safety. But HomeExchange is built upon a community of honesty, trust and commitment. When you are exchanging your home with someone you are entrusting your home with your swap partner and vice versa. HomeExchange also has lots of measures in place to ensure your safety such as your details are never shared with anyone, and there is a safe secure messaging system in place so your e-mail address and name are protected. There is also a verification process where members details are all checked and verified and members have detailed profiles. You can also check reviews that other members have left about a member to see what others thought. And there is also local support staff on hand who will speak your own language in case you need their assistance. And it is okay to say no to any potential swap that you may feel uncomfortable with. You only need to agree to an exchange that both parties are happy with. Being a member of HomeExchange costs £100 for a twelve months membership, if you do not exchange with anyone in that time then your second year's membership is free. There are lots of benefits to becoming a member such as you can list your own home, browse 65,000 listings, the chance to visit one of 150 + countries, you get to experience real life vacations and save up to 58 % compared to normal accommodation costs and there is also support 24/7 from the HomeExchage team. There are lots of great reviews of what members thought and you can also see some of the amazing homes that are listed on the website including the top ten family picks. If you like the sound of HomeExchange then they have offered someone the chance to a win a one years membership worth £100. So you could be swapping home's with someone for a holiday in a country you have always wanted to visit at a fraction of the cost a normal holiday would cost you. To enter then just enter the Rafflecopter giveaway below by signing in with your Facebook account or e-mail address and following the instructions provided. T&c's Open worldwide. One person from all valid entries will be selected at random via Rafflecopter to win a one-year membership to HomeExchange worth £100, no travel or additional costs are included in the prize. Winner will be contacted via the e-mail address provided within 48 hours of the competition closing. The prize will be provided by HomeExchange who will be in contact with the winner to arrange the membership. Yes we have discovered this since having #3 too, it really does skyrocket prices doesn't it and make sleeping arrangements tricky! This sounds like a great solution! Me and my husband are both self employed which means not only do we have the cost of the holiday we also have no income for the time we are away. Anything which makes a holiday more affordable sounds good to me. I have always fancied trying a house swap holiday, it really appeals to me. We have always holidayed by staying at friends and can throroughly recommend home swapping. WOW , never holidayed before but this would save me tons of $. Splendid. Wow, prize memebership is fab. & splendid. 2 fingers snap. It is tight, fly & off the chain. Thank you for the awesomeness, the contest, and generosity. Pick me, pick me! A Teddy Bear Picnic Is Better With Cake.